On March 29th, our AVID classes are going to be able to see the new Invisible Children video. We will also have the honor of meeting a Ugandan person who will be visiting our school. On Thursday and Friday we watched the original Invisible Children documentary. "A gripping story of a child’s journey through hell and back. 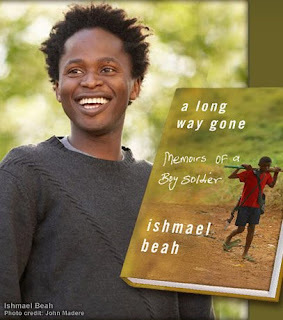 In A LONG WAY GONE, Beah, now twenty-six years old, tells a riveting story. At the age of twelve, he fled attacking rebels and wandered a land rendered unrecognizable by violence. By thirteen, he’d been picked up by the government army, and Beah, at heart a gentle boy, found that he was capable of truly terrible acts. Eventually released by the army and sent to a UNICEF rehabilitation center, he struggled to regain his humanity and to reenter the world of civilians, who viewed him with fear and suspicion. This is, at last, a story of redemption and hope."